Create themed displays with the most popular ARGUS Large Posters in this value-priced combo pack. Display them to motivate students, reinforce positive behavior, and sustain interest in learning. Each poster measures 13-3/8" x 19". 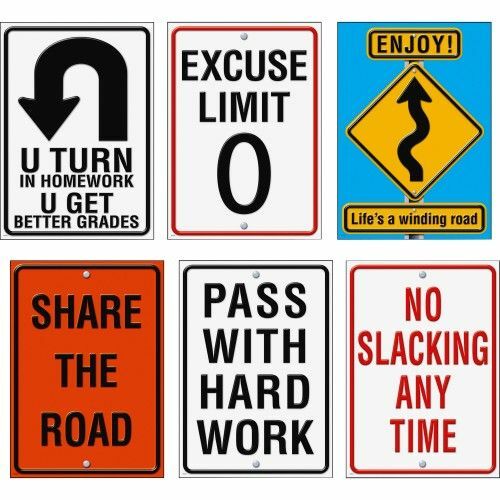 Life Signs posters include Share the Road, No Slacking Any Time, Excuse Limit 0, Pass with Hard Work, Enjoy! Life's a winding road, and U Turn in Homework U Get Better Grades. Posters are ideal for teaching students in prekindergarten to ninth-grade (ages 3 to 15).